I love the idea of telling plants to sit up straight. They do get so lolly at this time of year. It's always a bit disappointing when we feel compelled to get rid of planting schemes. Still.... another opportunity is presenting itself. Shame about the weeping birch though. 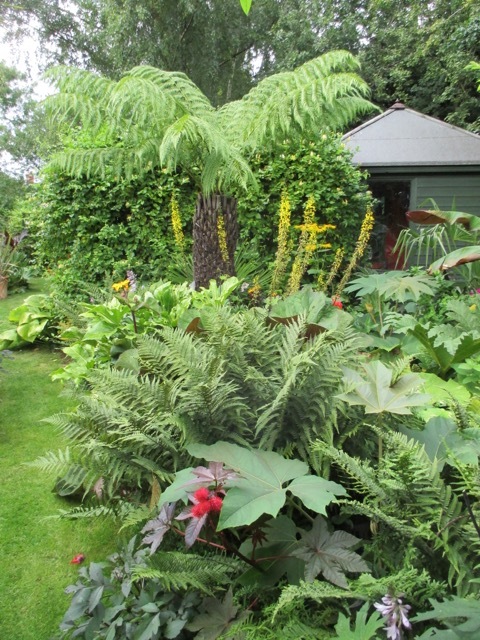 The sub-tropical garden looks splendid! 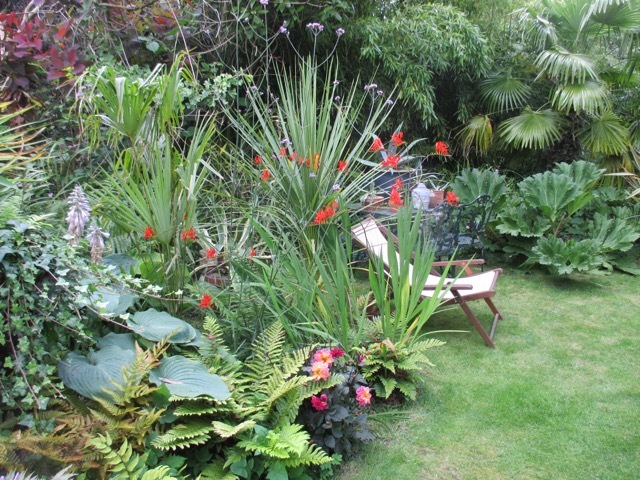 Perhaps taking a seat there might help you to achieve a more relaxed August holiday mood, and alleviate the need to plan which bit of garden you're going to dig up next? Hi Sarah, trouble is when I lie in the hammock instead of thinking beautiful thoughts, I tend to make cunning plans involving spades and bow saws!! 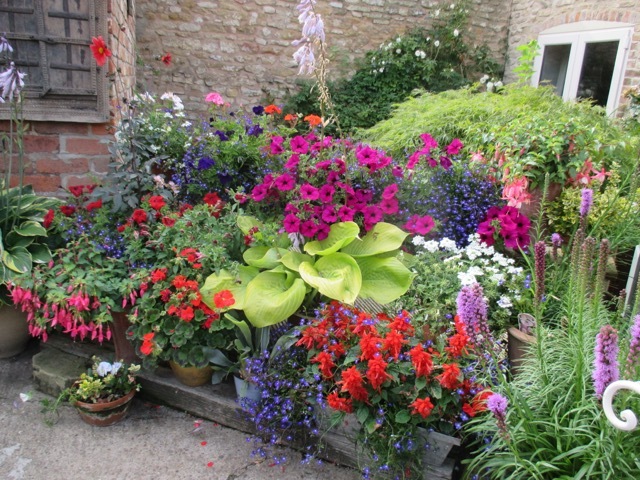 The garden is looking splendid Jane, and loving all the colour! Thank you kindly Mark & Gaz ! Gosh, the entire garden is a little piece of heaven. 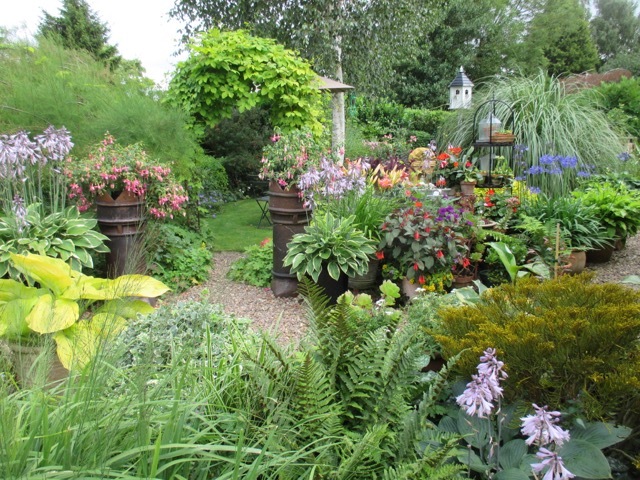 But that bedding garden with all the pots is pure bliss! You obviously have an artistic touch. I can't believe you successfully overwintered Cannas! Congratulations! It is my husband who does all the pots ! We have strict division of labour here! Our cannas do usually die long lingering deaths, so we are extra pleased that this one pulled through! 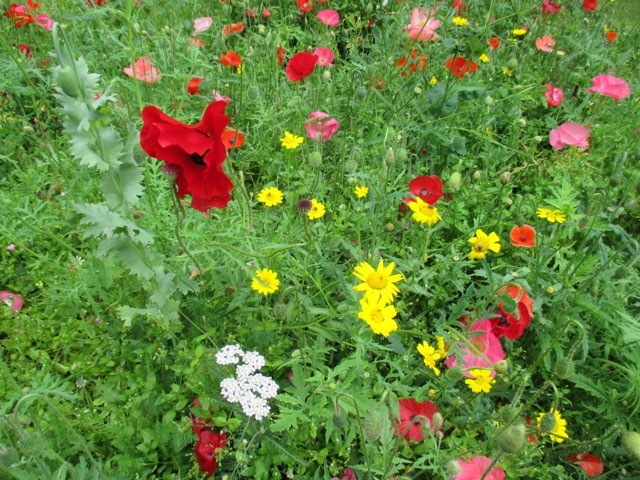 Lots of wonderful colour in your garden. It is the sign of a true gardener, now planning next year, what stays and what goes. 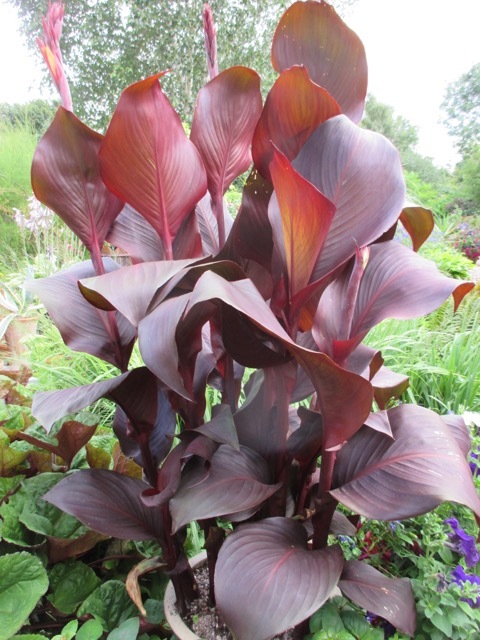 It is impossible to choose a favourite plant from above, I am impressed with the height of your Canna, what do you feed it on? Thanks Brian, for your kind comments. The canna is just fed fortnightly with a liquid feed, along with everything else, so no secrets there. It is the biggest, most vigorous one we have ever had. I love your garden, Jane. I wish you didn' t live so far away, I would love to see it. I know just what you mean about sprawling plants. They really bother me in July. I know I should do more dead heading to keep things tidy but I like things to seed around. 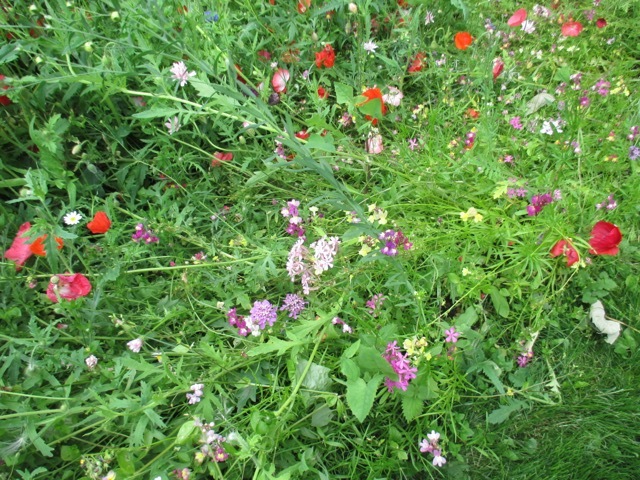 I have decided to do away with a large part of the wild flower meadow too.. 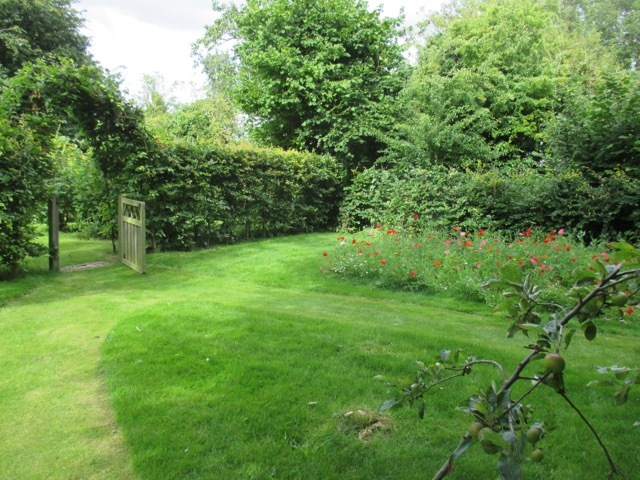 It is pretty in Spring and early Summer and then it looks a mess and needs strimming and nobody likes strimming. I can' t decide between a Piet Oudolf type area with lots of grasses or a tropical garden. Seeing yours has made me think that maybe tropical would be the most fun. Wow! Your pots are really impressive. Hi Chloris - the feeling is mutual as I love yours too! Go totally tropical and then we can swap notes - and maybe even plants and seeds ! 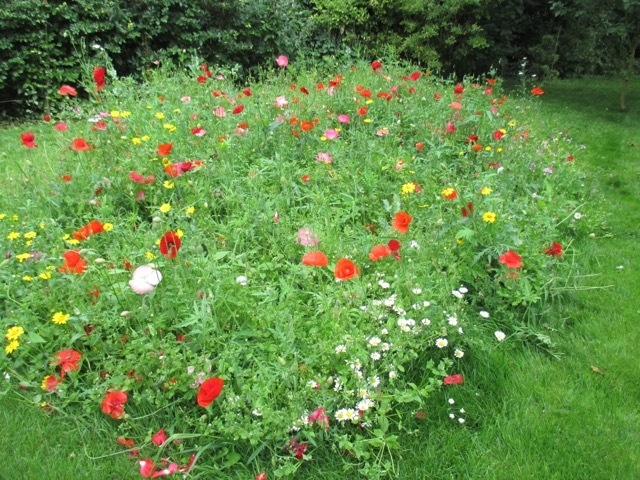 We have decided to kick the wild flower patch into touch from now on, as it just doesn't 'earn its keep', like yours, it only has a short period where it looks good. Hi Sue, did you think I was planning to finish someone off !! 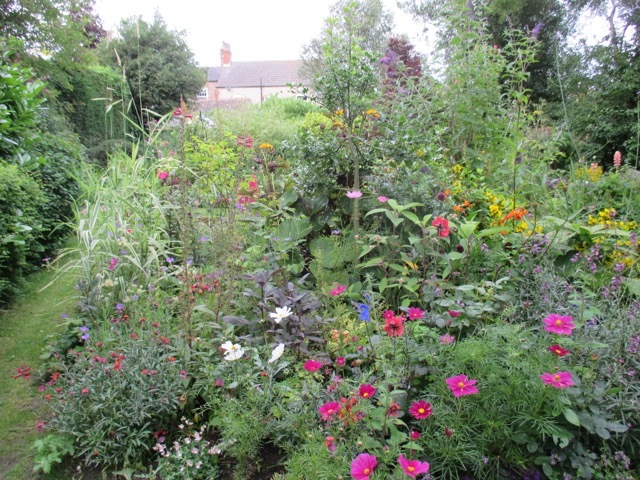 Thank you for kind comment about sprawly garden! 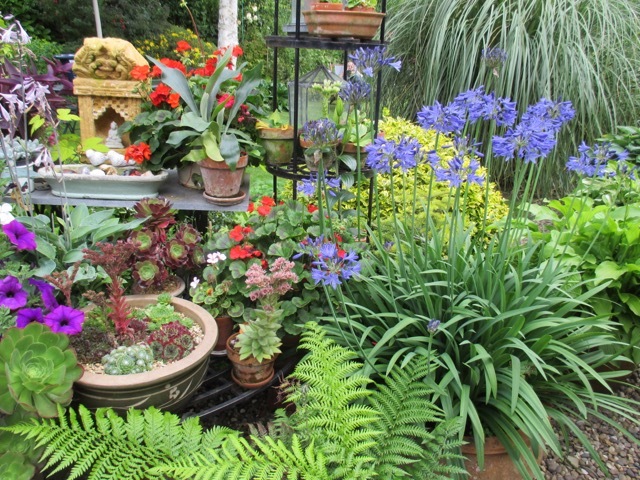 Oh my word Jane, your grden looks absolutely amazing! It's only now that I live in a colder climate that I wish I'd grown tropical plants when I lived in Lincs - I've been tempted to grow them here but tbh I don't think they'd make it out the polytunnel lol. I love your Canna, I keep losing mine over the winter. Sorry you have to lose your tree :( Do you know why it has died back? I have no idea baout how long these things are supposed to live. Hi Linda, whereabouts did you garden in Lincs ? We still manage to lose cannas overwinter!! 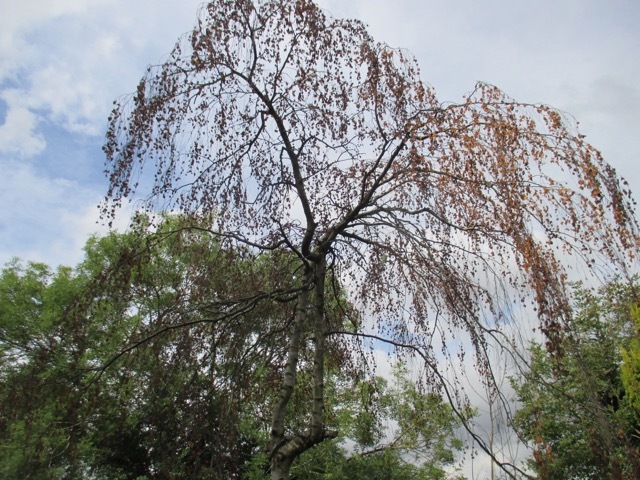 I don't know what my poor weeping birch is dying of, as it has no sign of disease or pests, so it is a mystery! Your garden looks heavenly, and I really don´t know which part is the best, it´s all beautiful. I love the jungle of August on your first photo, in August a garden ought to look in that way. Your tropical garden is so special, I wonder if this type of garden would do in our country. 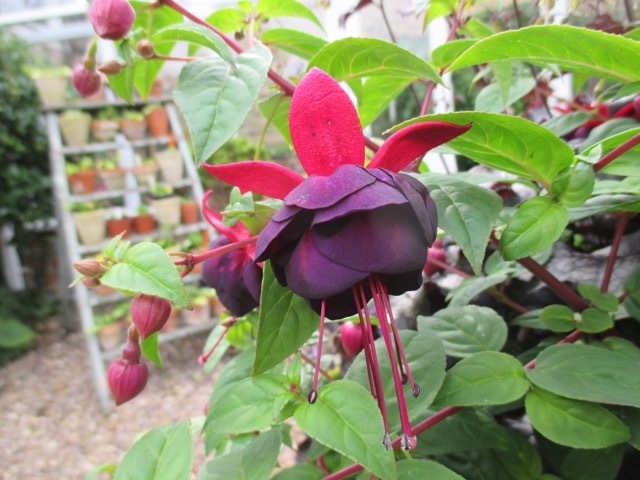 I´ll put the fuchsia ´Millennium´ on my wishlist, it´s a beauty. Long ago we had lots of Fuchsias but our garden taste changed, nevertheless I still have a weakness for some Fuchsias. Hi Janneke and thanks for kind comments. 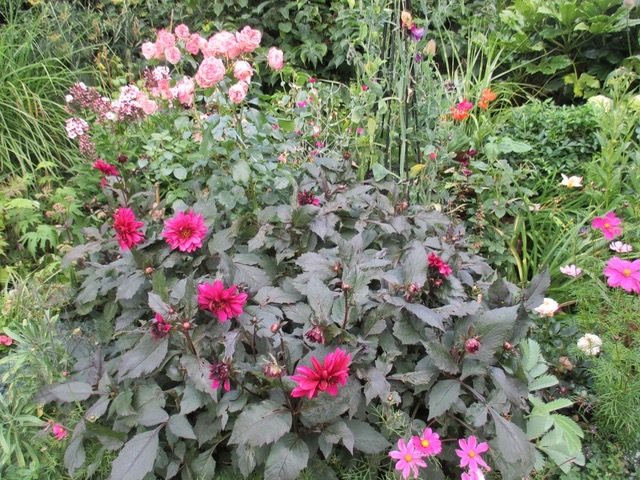 'Millennium' is really lovely, more subtly than a lot of fuchsias, and the colours are so dark and rich. 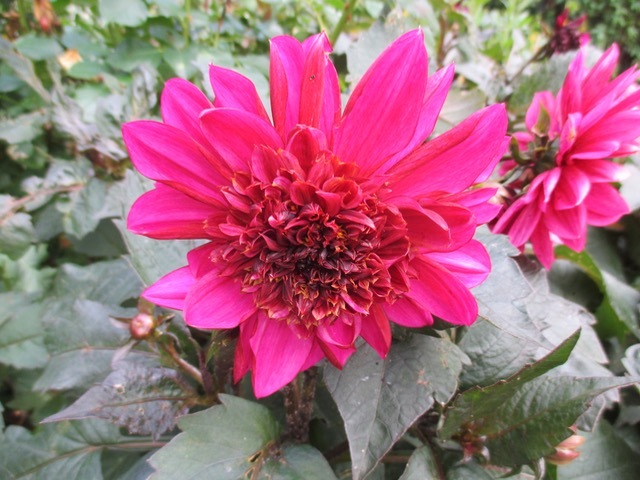 Your garden is looking great as ever but one thing I think we may share in common Jane is a dislike of staking plants, I am always undecided whether to stake the plants I know will tend to collapse from early in the year or to do it retrospectively which is normally the way I go. This year I have been very busy as the heavy rainfall we have been subjected to has flattened some which I would never have expected to be affected. Hi Rick, we have experienced the same results from heavy rain, and seen 'sprawlers' we don't usually see! The whole of my Charles de Mills rose hedge was weighed right down the other morning! I find it oh so annoying when plants get to this stage Jane. Even more so when I forget to put some support in - as happens more often than not. 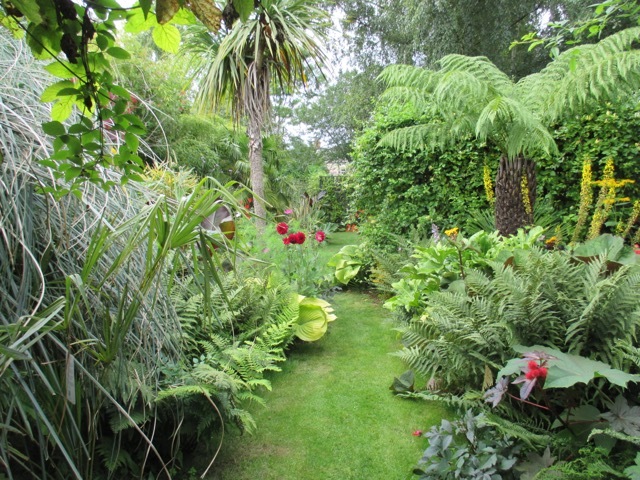 Your garden looking great and the tropical area is superb. Well thought out planting. It's never too early to start planning, isn't that what gardeners do year round? Hi Angie, I have passed your kind compliment on to the Exotic Gardener, so I hope it hasn't gone to his head! !Are you planning for next season already ?